Be the first to share your favorite memory, photo or story of Lindberg "Lindy". This memorial page is dedicated for family, friends and future generations to celebrate the life of their loved one. Lindberg "Lindy" Paris Ingram, age 91, died on March 18, 2019. He was a longtime resident of West Deptford. 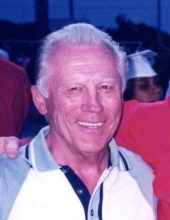 Born and raised in Woodbury Heights, Lindy graduated from Woodbury High School in 1944 where he was a talented athlete participating in varsity football, wrestling and baseball. He served in the US Navy from 1945-1946 during World War II in the "top secret ultra" decoding unit. After the war, Lindy attended the University of Tulsa until he moved home to run the family business. Lindy was a business owner all his life, operating local automobile dealerships and limousine sales. Lindy was elected to the Gloucester County Sports Hall of Fame, the Woodbury High School Sports Hall of Fame, and he was a founding member of the South Jersey Touchdown Club. He piloted his own airplane, and authored and published his autobiography, "Just a Poor Boy From Woodbury Heights" (Amazon.com). Predeceased by his brother William and sister Frances, he is survived by his children Thomas, Debbie (Dave) Allmond, Patty (Joe) Papania, Paul (Emily) Ingram, grandchildren Anthony, Paul, Lindberg, Jonathan, Frank, Zoe and Caleb, and 14 great grandchildren. Friends may greet the family on Saturday after 10am in the Budd Funeral Home, 522 Salem Ave (Kings Hwy), Woodbury, NJ. Funeral service will be at 11am. Interment Wenonah Cemetery. Memories may be shared at www.buddfuneralhome.com. To send flowers or a remembrance gift to the family of Lindberg "Lindy" P. Ingram, please visit our Tribute Store. "Email Address" would like to share the life celebration of Lindberg "Lindy" P. Ingram. Click on the "link" to go to share a favorite memory or leave a condolence message for the family.